I've been feeling a little stressed for no particular reason this week. A lot has been going on. For instance. . .
We have a hurricane/tropical storm headed our way. This should worry me, but I'm kind of intrigued by the idea. We might end up going to stay at a hotel for a bit. Apparently the military will pay for a few days in a hotel during a hurricane. I need to pack some over night bags just in case, but I'm putting it off. Claire has learned to "sort of crawl" by pulling her body forward using only her arms and is determined to get into the dog's water bowl. She's really cute and she loves her mobility. Unfortunately it also has revealed how terrible I am at floor cleaning. I upped my sweeping from once a day to twice a day and she still picks up a ton of dog hair and I have to change her clothes after her floor sessions. I am kind of fantasizing about the "Swiffer Sleepers" from that SNL "commercial" skit. They seem like a really good idea. I've been crocheting a Christmas stocking for Claire. It's coming along really nicely. I've been reading portions of the Lord of the Rings and the Hobbit. . . again. I got a really cute video of Claire playing her sister's toy piano. I've been exercising a lot and I'm not sure I really have much weight left to lose but somehow I still have that belly that won't go away. We're still one car short. Matt's has been in the shop for awhile now so we have to arrange me driving him to work if I need the car for a day. Mostly, though, he just takes the car and I'm stranded. It's made shopping and errands a major pain. Oh, and the dryer isn't drying. . . I don't know why I'm so stressed. It doesn't hit me until the afternoon. About the same time as I have to make dinner I just have no patience. It's not like me. Coryn was supposed to have her first gymnastics class this week but after a half hour drive across town, we found out that the instructor had had a death in the family and canceled class. She'd tried to get a hold of people, according to the guy at the community center, but hadn't been able to contact everyone. I guess you can't be mad when someone is dealing with a personal tragedy like that, but Coryn was pretty disappointed. Anyway, here is a dose of cute. Fun that gets my floor clean=win! I lived in FL most of my life. . . so hurricanes are usually no big deal. You deal with it and move on. Your kids are so cute and I saw all of her art on your other blog. Too cute! As far as the crawl goes. . . I think a lot of babies do the "army crawl" first. I miss that stage. Enjoy it!! You might be feeling impatient because you're not getting to refill your love tank. You need time for yourself and for friends. I know the feeling! 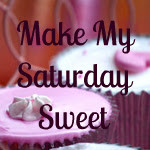 Thanks for linking up on my blog hop! I hope you have a wonderful weekend and that the hurricane/tropical storm doesn't make life unpleasant. Take care!